At its main booth, Hall 11, stand D90, visitors can get an up-close insight into superior workflow and cost-reducing capabilities for designers and manufacturers. 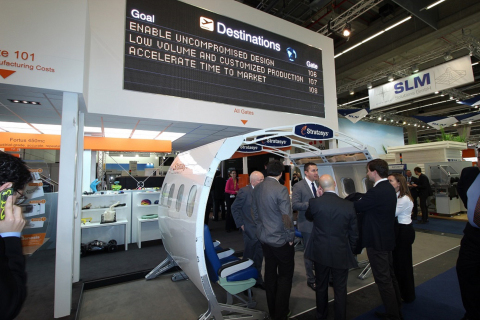 The aerospace-themed stand features a remarkable, full-size airplane cabin interior that employs a combination of state-of-the-art FDM and PolyJet 3D printing techniques for prototypes (various seat parts), manufacturing tools (sand casting pattern for seat base) and end-use parts (sidewall upper skin, electrical clips and air ducts). StreetScooter (Aachen University, Germany) an affordable and sustainable fully functional prototype electric car designed and built in just one year with the Stratasys Objet1000 – the world’s largest multi-material 3D production system. Normal (USA) perfectly demonstrating mass customization production by 3D printing custom-fit earphones using Fortus 250mc 3D Printers. Eletro Zagonel (Brazil) controlled design confidentiality and accelerated time-to-market for their superior shower system by producing functional shower prototypes in-house using the Objet30 3D Printer. Legacy Effects (USA) creating “impossible to build” costumes and final props for Hollywood blockbuster movies like “IronMan” and “RoboCop” using Stratasys 3D Printers. Demonstrating how creatives are pushing the boundaries of 3D printing, Stratasys is offering EuroMold visitors a chance to view 12 stunning 3D printed sculptures by three influential artists in a special gallery in Hall 11, stand FN01. Entitled “The Sixth Element: Unveiling the Beauty of 3D Printing,” the gallery features 12 ground-breaking new works by Professor Neri Oxman, Nick Ervinck and Eyal Gever.